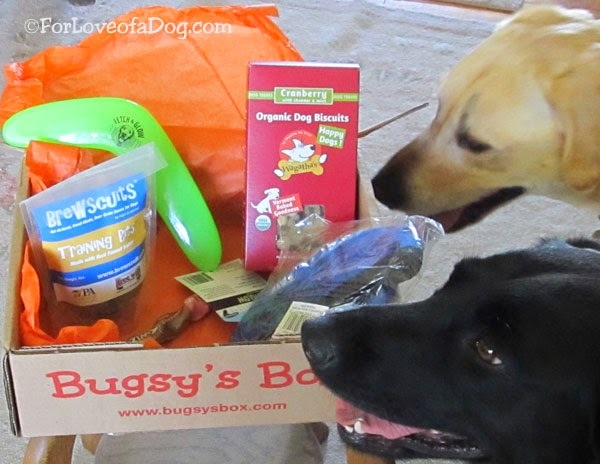 Rosie and Rudy get ready to review Bugsy's Box dog treats and toys. 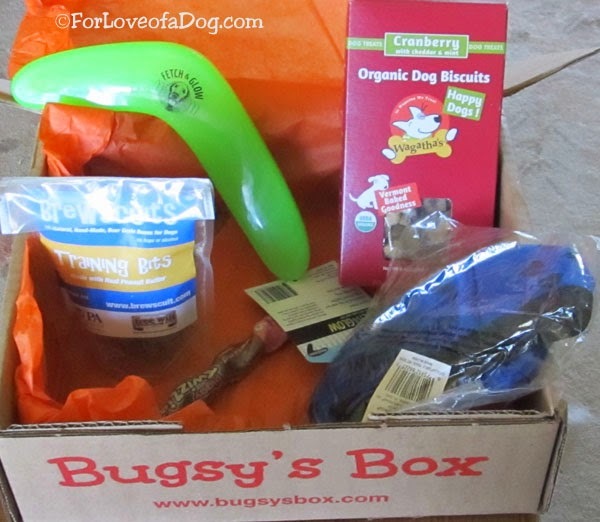 Bugsy's Box is a treat for those who enjoy pampering their dogs and consider them family. From delicious treats to fun toys and other essentials - many of which are hard to find locally - you can count on high-quality, gourmet, happy surprises for your favorite pup. Paws up! Rosie especially loves playing fetch with this toy. Definitely a winner. 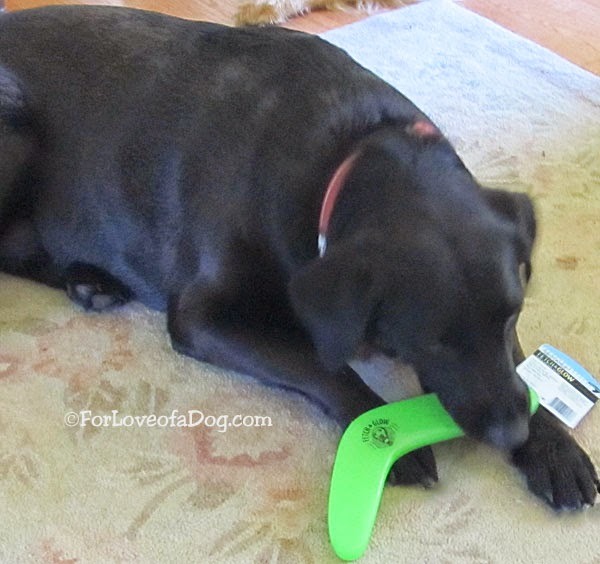 Rosie loves the Fetch & Glow Boomerang in our Bugsy's Box. Collapsible Travel Bowl is perfect for any dog on the go. Features cute paw prints on the outside and a durable inner lining. Can be used for water or food when you're out and about with your dog. No retail price available, however a similar item on Amazon retails for $4.99. Paws up! Though I doubt we'll use this often, it's great to take along in the car. Since it folds so small, it easily fits in the glove box. Jeffie was very enthused about the Brewscuits dog treats in our Bugsy's Box. 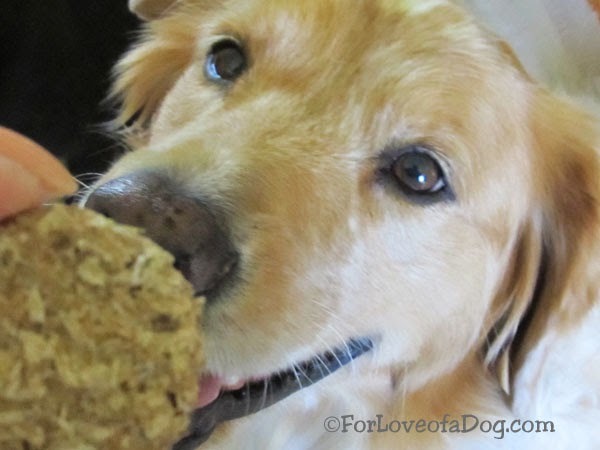 Brewscuits Treats are hand crafted dog biscuits that incorporate the whole grain used to brew beer to create a one of a kind treat. Brewscuits do not contain any chemical preservatives or grains that are difficult to digest (corn, gluten, soy) making them the perfect biscuit. Plus, they're alcohol free. We received Brewscuits Training Bits in peanut butter flavor. A 4 oz bag retails for $6.50. All paws up! These were the real winner! Jeffie, Rudy, and Rosie LOVE them. Definitely on my "to order" list. Rudy thought the Brewscuits were the very best thing in our Bugsy's Box. Piggy Twizzies - all natural, grain free, chews high in protein and easily digested. Grain free, gluten free, soy free and dairy free. No artificial ingredients, colors or flavors. And they naturally preserved. A package of 30 retails for $69.03 at Amazon. 3 dogs - 1 Twizzie. You do the math. So far no dog has gotten lucky and tried this treat. Paws up! All three dogs definitely liked these organic dog treats and I've bookmarked their website. As you can see, our June Bugsy's Box contained products that retailed for about $34.73 - not including shipping. Not at all a bad deal for $29. AND if I'd been a 3 month subscriber my price would have been $19 which would have made it a fantastic bargain! We reviewed the June Bugsy's Box. This Bugsy's Box afforded us an opportunity to try products that are totally new to us. That's a very good thing! 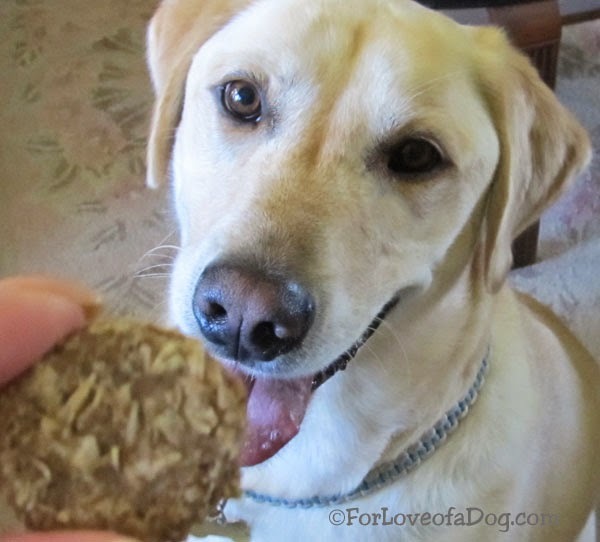 Rosie is all smiles about the Wagatha's dog treats in our Bugsy's Box. The dogs certainly gave paws up to the treats! If you like surprises and don't mind a product or two that you might not care for, the Bugsy's Box is barking good. The one "catch" is that you definitely need to manage your subscription. If you decide not to continue with their program, you must cancel. Otherwise your subscription will continue and you will be billed. All in all, FUN! I'd consider ordering for my dogs, as well as ordering gift subscriptions for friends. Fetch Bugsy's Box now! 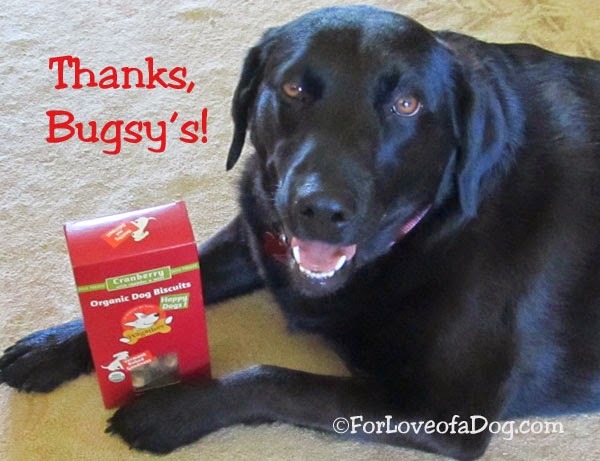 * Disclosure: We received one Bugsy's Box in exchange for our honest review of the product and service. We received no other compensation - financial or otherwise. Wow - chock full of goodies and lots of the edible! The best kind. Nice review. We like to choose our own stuff, so we aren't fans of the box services, but if you aren't into shopping, it is a great way to get stuff for your pup! What a great review! Lots of good stuff in there. We've never had a Bugsy Box. They really fill their boxes up with goodies! I enjoyed your review.